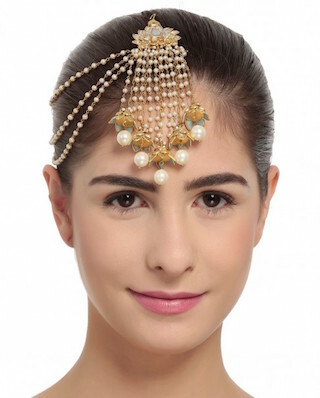 Designer Jewellery For Your Wedding - For Less Than Rs 7,000! It sure is the most exciting time for you, my dear bride! You want to be the best version of you in all your glory! Besides the outfit, picking out the most fitting designer jewellery for brides seems like a huge task that plays constantly on your mind, we know! If you are a girl looking for those coveted designer jewellery pieces, leave your worries behind, we’ll lead you from here! 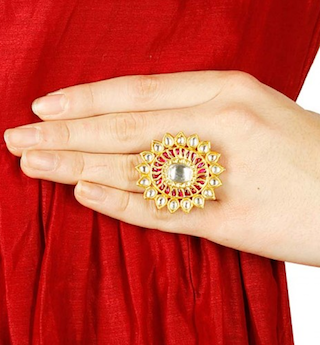 This fancy brooch is just what you need to add that hint of sparkling charm to your outfits. 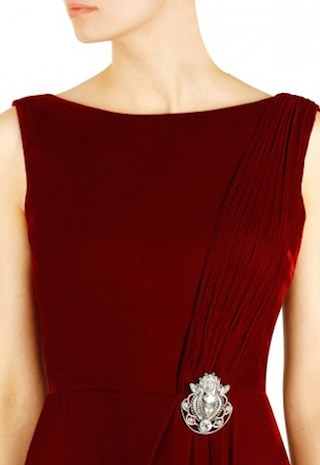 Wear this on a deep-coloured gown or dress to add a royal touch. You can even use it to tuck in your dupatta at the shoulder. It’s simple yet such an elegant addition to your jewellery box! Price: Rs 6,500. Buy it here. Payals so pretty can make you smile while you go around dancing in them. We love the multi-coloured stones in the triangular shape, along with those tiny round ones that highlight the hem. This pair is surely delightful and makes our eyes twinkle. Price: Rs 4,785. Buy it here. Every girl must have one of these massive rings that she can just slide on and make any outfit look even more stunning. This round floral ring with glass and pink crystals is one hot thing! Just about perfect to create that much needed bridal drama! Price: Rs 6,600. Buy it here. We’re going wow over these gorgeous earrings. The multicolored stones, three-tiered, round-shaped beauties are what every bride needs to get that glamorous look at her cocktail or reception night! The different hues and gold can be matched to almost any ensemble and are, thus, super handy! Price: Rs 6,154. Buy it here. We can imagine you wearing this to an afternoon soiree, maybe your mehendi! The lovely lotus-shaped dangling pearls and tinted glass on those strings make us happy! The different elements come together to give that contemporary swing to every modern bride! Price: Rs 6,525. Buy it here. To get the traditional look of a nathni alongside the other jewellery details for your big day, this one seems ideal. 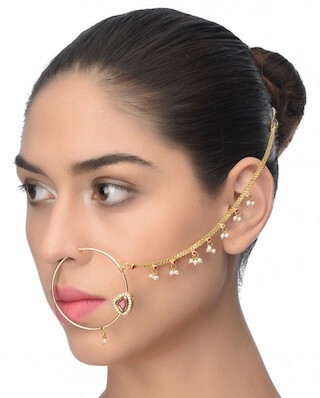 With the hint of rani pink stone and little pearls hanging throughout the string, this gets our approval. Old-fashioned and appealing! Price: Rs 2,900. Buy it here. Who wouldn’t love a brightly coloured cuff on their hands? For the in-between functions when you want to add some colour into your jewellery, this seems the best pick! Those cute orange and pink tassels loosely stitched into the cuff with the other interesting details make it to our must-have list! Price: Rs 3,500. Buy it here. A conventional pair of ponchi amulets are a totally desirable duo for every bride-to-be. 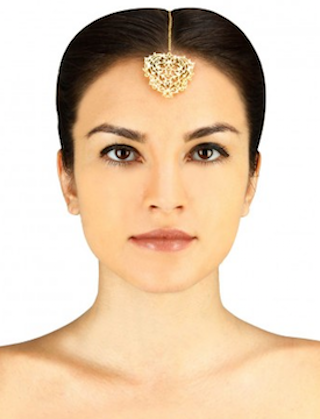 Wear this with your bridal lehenga and it will gracefully blend with all the polki jewellery! With this you’ll be able to adorn your arms without going OTT. Price: Rs 6,800. Buy it here. Lastly, to strike off this very essential jewellery piece for the bride, we’ve picked out this swarm of gold jaal beads necklace. Perfectly balanced from one end to the other, this necklace will do justice to all those outfits that have a comparatively plain neckline! Get this, now! Price: Rs 4,000. Buy it here. MUST READ: #POPxoBrides: Floral Jewellery To Make Your Mehendi Look WOW!